With growth powered by a flood of venture capital, the nation’s technology sector is hungry for office space, which is reflected in the surge in tech-sector leasing last year, with Seattle among the metro areas leading the charge. That’s good news, so long as the economy keeps humming and the venture capital dollars keep flowing. However, the figures for Seattle and other leading tech cities also demonstrate just how much the health of their office real estate markets are dependent on the continued vitality of the tech sector. 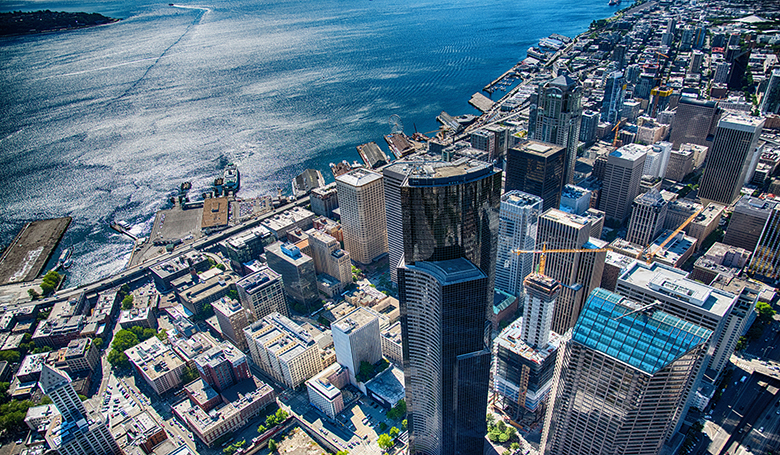 The Seattle area ranked fourth in the nation in a measure of cities that accounted for the largest share of U.S. tech-related office leasing in 2018. Tech leasing in the metro area accounted for 7.2 percent of all tech leasing nationwide, according to a just-released study by commercial real estate services company Cushman & Wakefield. Ahead of Seattle on that measure were Silicon Valley, at 19.3 percent; greater San Francisco, at 16.9 percent; and Manhattan, at 8.9 percent. And, in a related ranking of cities based on the share of tech leasing within a city in 2018, the Seattle area ranked fifth, with 46.8 percent of all office leasing related to tech companies. Ahead of Seattle were Silicon Valley, at 78.1 percent; Salt Lake City, 66.4 percent; greater San Francisco, 60.9 percent; and Boston, 47.7 percent. For the purposes of the study, the tech sector is defined broadly and includes 46 individual industries, ranging from cloud computing, to cybersecurity, to transportation-related technology. The tech sector leasing the most space in 2018, according to the study, was life sciences, accounting for nearly 20 percent of total tech leasing nationwide, followed by data processing, hosting and related services (such as cloud computing) at 15 percent. The study also notes that the oversized presence of the tech industry in the nation’s office-leasing market is, in no small measure, powered by a surge in venture capital. Last year, VC investments in the tech sector nearly doubled over 2017, to $131 billion, up from $72 billion. The flood of capital cemented the tech industry’s status as the largest lessor of office space in the country in 2018, representing 26.7 percent of the 311.9 million square feet of new leases signed across the 86 markets tracked by Cushman & Wakefield. “While still centered in the key tech hubs that have been the core tech cities in the U.S. for the past two decades, the [tech] sector is also expanding as new technologies and new industries emerge,” the Cushman & Wakefield study concludes.